A fortified structure of some kind has existed on this site since the 12th century, but it wasn’t until three hundred years later—under the ownership of Jean, Lord de Loges—that the castle took on a fortified look, with four new towers and a drawbridge. His grandson, Hugues, is responsible for the Renaissance aspect that we see today. Through the centuries various families acquired and sold the property—usually the case when someone died without heirs. By the 20th century, the château was rapidly becoming dilapidated until sold in 1987 to Yasuhiko Sata of Japan. He opened the property as a luxury hotel in 1990. Four years later, he was awarded the Chevalier des Arts et Lettres for his contribution to the arts and music. There are other restaurant options in the vicinity. The hotel can make suggestions and arrange transportation if needed. Poilly en Auxois is about half an hour by car from Dijon. Take the A38 highway, exit at 24. The nearest train station is at Dijon. Yes. Private chapel available; Inquire hotel for details. 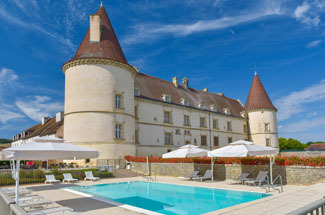 A castle hotel for golfers in France is not all that common. At the Château de Chailly, you can literally step outside and onto the course. Guest rooms at the château are spacious with clean and comfortable decor. With the exception of the suites, which are in the main part of the château or its towers, rooms are found in the wings attached to the main building. Some have small terraces. All have large bathrooms with nice touches such as heated towel racks and bathrobes, and all rooms are air-conditioned. Restaurant options at the château are either at the Armançon, where you can indulge in gourmet fare in a formal main or private dining room, or the Rubillon, a buffet-style situation in a vaulted hall. The hotel also offers an English-style bar and a wine-tasting cellar.